Are you living without a car, can’t afford to buy a house, or putting off your wedding until you can pay for a ring? Being on a budget does not mean you have to go without. You can still make these large purchases on a budget. Unfortunately, there are some parts of cities and towns where public transport is not an option. Some small towns do not have apartment communities. For people living in these places, moving to the city is not always a possibility because the cost of living increases substantially. Some of us will even put off our engagements for years before we can afford a nice ring. So, big-ticket items like cars and houses are necessities for many of us, even for people on tight budgets. 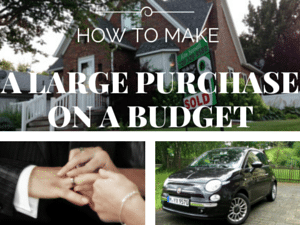 So how can we afford to make a large purchase on a budget? Well, first thing is first. We don’t necessarily have to save as much as we think. By doing a little homework, we can find big-ticket items for less money. Adam of Modest Money offers some suggestions on ways to secure a car, house, or wedding jewelry for less. Enter Your Details for a FREE Savings Estimate Because it Could Change Your Life..
Are You Saving Enough For Your Future? The Best Way to Consolidate Debt? For your peace of mind we’re a member of the Credit Ombudsman Service (COSL). Debt Settlement Solutions for Australia.